Let’s cut to the chase. 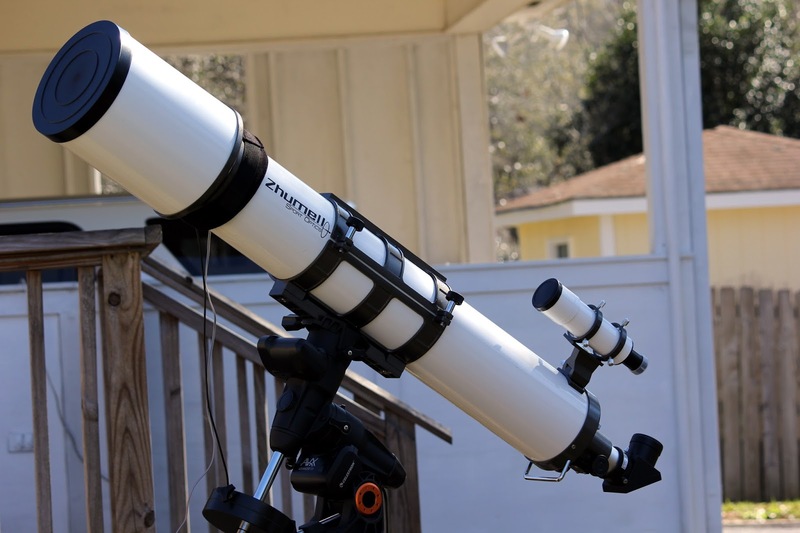 A constant in amateur astronomy since I was a boy in the 1960s has been that no matter what sort of telescope you own or like—Newtonian, Schmidt Cassegrain, whatever—there is one you’ve longed for even if you won’t admit it to yourself. One telescope you’ve dreamed about over the years. Yes, friends, I am talking about that holy grail of amateur astronomy, the six-inch refractor. You want one, I want one, we all want one. For those of us who lived through the sixties, the six-inch lens-scope is especially hallowed, since back then it was an almost mythical beast, one whispered about in hushed and reverent tones by the most knowledgeable and illustrious among us, gurus like Patrick Moore. The closest most of us ever got to a six was seeing one occasionally pictured in the Unitron catalog, where its price was listed as an astounding $6,000. That is equivalent to at least $40,000 today, and maybe as much as $75,000. Back then, 6K was over half the cost of a very nice home. In other words, a big lens-scope was the impossible dream. And for decades a six-inch refractor remained just a dream for the average amateur. Things began to change in the waning days of the twentieth century, however, when the Chinese telescope industry broke the bonds of 60x600 refractors and began producing decent gear. One of the more impressive offering from one of the premier Chinese firms, Synta, once they found their feet was, yes, a six-inch refractor. It wasn’t dirt cheap at first, with the earlier examples going for something over $1500 but that was a darned sight better than $40,000. Actually, there were several companies, including Astro-Physics and Takahashi, selling six-inch refractors for considerably less than 40 grand. And not only were they selling sixes, they were selling apochromatic, color free, sixes. However, while not as costly as that old Unitron achromat, they were certainly not cheap, and might as well have been 40K as far as I was concerned. The Synta six, sold under both the SkyWatcher and Celestron brand names (even before Synta bought Celestron), had another plus in addition to its price: its focal ratio. One of the things that formerly made a six-inch refractor a crazy dream was the mount one required. Do a six at f/15 or f/20 and you have one hell of a long, heavy tube that demands a big mount and a tall, heavy pier or massive tripod. The Chinese got around that by focusing on fast achromats, initially f/8, but soon also f/5 and f/6. That made mounting one on a Great Polaris clone mount like the CG5 at least somewhat practical. Of course, take a six-inch achromat down to f/8 and there’s a big penalty in the form of chromatic aberration. Why do you think the Unitrons sported such long tubes? To keep the color purple suppressed. I figured the color wouldn’t be just bad in one of these telescopes, but kaleidoscope bad. I didn’t want any of that mess, so all through the nineties and into the oughts, I resisted the urge to finally get a six. Who wanted something that made a Short Tube 80 look like an APO? I made that determination merely by assuming—and you know what they say about that word. I hadn’t actually looked through a Synta (or Meade; they were now in the six-inch achro game too with their LXD55 rig), but I was sure I wouldn’t like one. Over the past decade, I did get quick peeks through a couple of Celestron 6-inch f/8s, but not long enough looks under good enough conditions to allow me to really make up my mind about these telescopes, much less change it. 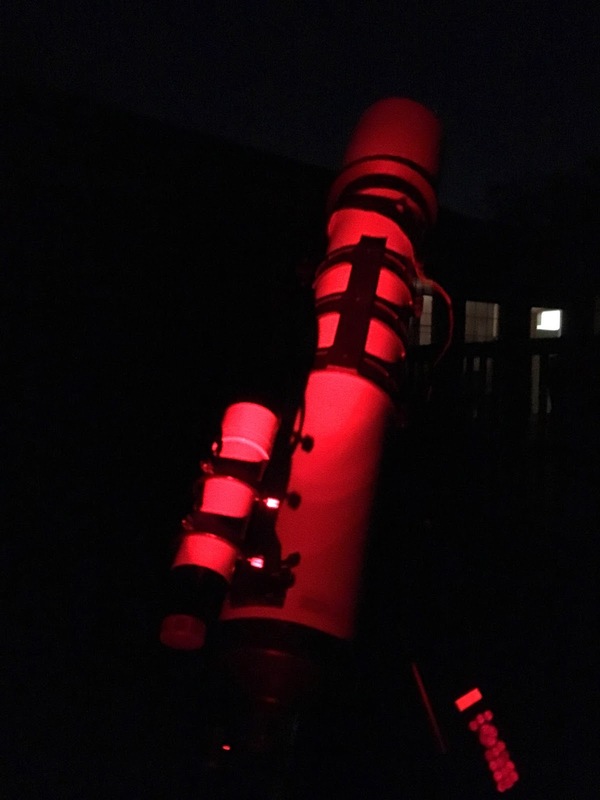 That change finally began a few months ago when a new club member showed up at our dark site with a Celestron f/8 riding on an Atlas mount. I was able to spend some time at the eyepiece, and was fairly impressed. On the deep sky, performance was very much like what I’d have expected out of the average C8. In addition, at f/8, the scope could provide some nice semi-wide-field views. Contrast was actually impressive, and despite fairly poor condition the telescope pulled its own weight on Jupiter. Most of all…it was a six-inch refractor…and came with a big helping of that ineffable je ne sais quoi. Color? There was color on Jupiter and on bright stars, but it was not nearly as bad as I’d expected. Whether because in my mind I’d exaggerated the degree of chromatic aberration one of these scopes would present, or because my middle-aged eyes are just not as responsive to the dread purple haze as they once were, I didn’t know. All I knew was that while certainly noticeable on bright stars and the planets, it was not debilitating, not for me. Thus, the wheels began to turn slowly, ever so slowly. I’d occasionally tell my friend Pat that I was thinking about a 6-inch refractor. Either the trad Synta f/8 or one of the new Explore Scientific (JOC) f/6.5 jobs. I talked about doing the deed, yeah, but still couldn’t quite muster the courage to get off the C8 fence. Not until a couple of weeks ago. One a.m. I was shooting the breeze with the Cloudy Nights gang on the refractors forum, a place which I seem to inhabit frequently of late. The topic? Six-inch achromats. I registered my opinion that a 5-inch class ED scope was a better bet than a darned old achromat. The chromatic aberration inherent in a large, fast achromat would, I said, reduce its performance to the level where it was worse, considerably worse, than that of the smaller telescope. One of the folks participating in that round table was my old friend Barry Simon, the managing director of the Deep South Regional Star Gaze and President of New Orleans’ Pontchartrain Astronomical Society. Barry must have noted a certain wistfulness beneath my hard-edged “get an ED” line. Or maybe he just saw me as a lost soul in need of rescue. But he was soon emailing me to tell me he had a six-inch f/8 achromat for sale. Turned out Mr. Simon would be in the Gulfport, Mississippi area (halfway between New Orleans and Mobile) on business shortly, and that he’d be happy to meet me there so I could pick up the scope. Honestly, I could hardly wait. A little Googling (or more properly Binging) turned up favorable reports on the Zhumell. It sure looked good with a large and lovely white tube. 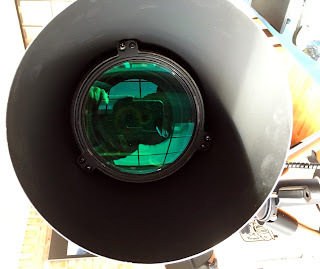 While it was apparently made by another Chinese company, it did look a lot like the JOC scopes sold by Meade and ES save for the fact that their weird short, fat dewshields had been replaced by a more normal looking one. Just before I was to pick up my new refractor, Barry emailed that he’d been able to get the Zhumell out into his backyard for a test, and had been favorably impressed both by the optics and by the fact that the scope did fine on his VX mount. I was very happy to hear the latter, since it made my plans for the scope more practical. What was I going to do with a six-inch refractor? My bag right now is DSLR imaging. Imaging through my 120mm SkyWatcher ED refractor on my CGEM mount. That pair has worked well. So well that I’ve been awfully bored during observing runs. Start the scope auto-guiding and tell Nebulosity to begin firing off a series of sub-frames and there is not much else for me to do. I thought it would be nice to have a visual scope to take to star parties so I’d have something to occupy me while the telescope, Hermione, took pictures. That was where the 6-inch came in, and being able to use it on the VX meant I wouldn’t have to drag my Atlas along in addition to the CGEM. On the appointed day, I motored the one hour west to Gulfport to meet Barry and have lunch at the local Newk’s. The trip was pleasant enough, but I gotta say I was in an agony of anticipation and it was difficult to keep the 4Runner at a somewhat reasonable speed on I-10. Finally, the exit, and after a couple of wrong turns I was pulling into the parking lot of the restaurant where I spotted Barry and another old buddy, Gabe Dickens, a well-known observer from the Gulfport area who would be joining us for lunch. After depositing the new girl in the 4Runner’s cargo area, it was lunchtime. This was my first visit to Newk’s, which is a step up from the fast food joints, and features a rather upscale menu for a casual and inexpensive sort of place. I ordered the shrimp and avocado salad, and settled in for a pleasant half hour of eating and talking telescopes and the local amateur astronomy scene with Barry and Gabe. As good a time as I had, I must admit I was preoccupied. I was antsy to get the refractor home and get her settled on a mount, which I now suspected might have to be the Atlas or the CGEM. Holding that big tube in my arms, I had become doubtful about the VX. 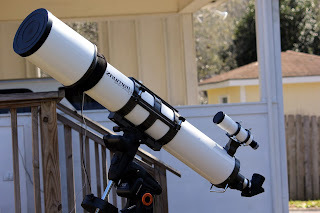 Yes, a six-inch f/8 refractor is about the same length as a six-inch f/8 Newtonian, but the weight is kicked up several notches. You just don’t realize how heavy a refractor in this class is until you pick one up. Then you understand why the mount on that Unitron f/15 had to be such a monster. Home again, I deposited the OTA in the usual scope staging area, the sun-room, and did some thinking. It sure would be nice to be able to use the VX for this telescope, and since I’ve used C11s quite successfully for visual work with CG5 class mounts, I decided to give the VX a go after all. 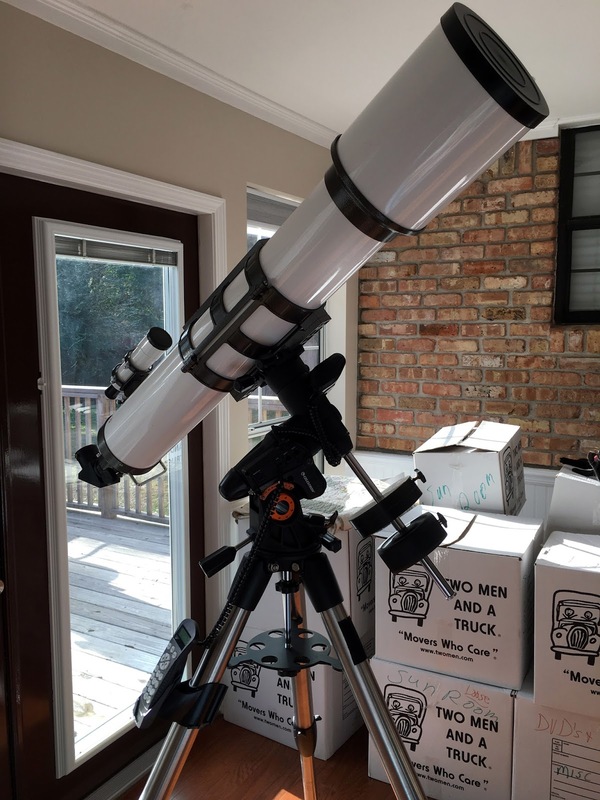 I’d try the refractor on the mount in the house first and see how it went before going to the backyard. The first thing to be challenged was not the VX, but me. It was not a pleasure getting the big tube onto the GEM. 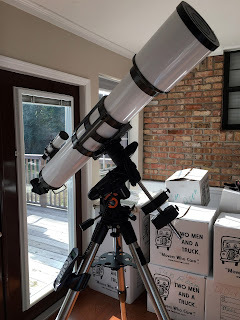 Taking the utmost care, I finally got the refractor’s Vixen format dovetail settled into the VX’s saddle, tightened down the bolts, and triple checked to make sure the scope was fully seated before letting go. The mount didn’t come crashing to the floor under the weight, so I proceeded to roughly balance in RA and declination. Barry had warned me it would take over twenty pounds of counterweights to balance the tube, so I had already mounted two 11-pound Synta pancake weights on the declination shaft. Reassured, I disassembled everything and moved mount and scope to the backyard, once again struggling with the OTA in the course of getting it on the VX. While the mount had responded well with the big tube when it came to slewing, I wasn’t sure how shaky the combo would be. Though I didn’t extend the VX legs all the way, I did extend them almost all the way, about 80%. I knew that if I didn’t, I would be crawling on my belly like a reptile when viewing objects anywhere near the zenith. I thought I’d try the setup with the legs that far out, and if it were too shaky, I’d add Celestron’s vibration suppression pads to the mix. If that didn’t work, I’d just have to collapse the tripod and think about cobbling together some sort of half-pier extension. We all joke about the New Telescope Curse. The propensity of the skies to cloud up with the arrival of any new telescope, no matter how small. In theory, my purchase of a six-inch refractor should have caused severe thunderstorms if not tornadoes, but it looked like I was to be spared the curse. Or maybe the weather gods were just toying with me. While the skies were not cloudy, not completely cloudy, they were not exactly clear either. Not by a long shot. Haze. Drifting clouds. Periods of overcast. I thought the sky would be just good enough to tempt and tantalize without allowing me to really see what the refractor could do. Nevertheless, I persevered. I had a new scope and I was going to take first light with it. After getting the (nice) 50mm finder aligned on a distant tree, I proceeded to goto alignment, doing my normal 2-4 routine with the Celestron hand control What did the bright stars look like in the 12mm reticle eyepiece? They looked OK; certainly they were not purple hued horrors, but it was not quite dark enough, I thought, to tell the tale color-wise. When I finished the goto alignment (I didn’t bother with an AllStar polar alignment; one just isn’t needed for visual work), it was rubber-meets-road time. As with Hermione, I chose a bright star as our first light object. Vega, which I’d used with the SkyWatcher, was now too low, so Deneb was the target. When the slew stopped, I inserted a 16mm eyepiece, my 100-degree Zhumell Happy Hand Grenade, and had a look…and… Not bad. Not bad at all. Once you made allowances for the night’s punk seeing and my astigmatism-riddled eyes, the star actually looked pretty good. Was Deneb colorless? No. There was a small purple halo, but it was small and relatively faint and not disturbing. To my eyes, Deneb just look any worse than a similarly bright star does in our 4-inch f/6.5 AR102 refractor. Otherwise? Near as I could tell under the conditions, the star test looked good. Collimation a bit out (from what I could tell with the star boiling and jumping) but not terribly bad. Later in the evening, I had a look at Rigel at various magnifications high and low. Purple halo? Yeah. That bad? No, and the star’s tiny companion was easily visible. Still later, I dared to turn the scope to Sirius. If the seeing had been better the view would have actually been surprisingly nice. What made it ugly was not so much the chromatic aberration, but the seeing-induced bloating and boiling. How was the telescope otherwise? As far as focal ratio goes, 150mm at f/8 is a nice place to be. With a 30mm eyepiece it approaches wide field, but the scope packs enough millimeters to get you to 200x without resorting to overly short eyepieces. Contrast seemed good given the hazy conditions. The focuser? Typical Chinese rack and pinion, but not bad. It had no problem with my heaviest eyepieces, and was smooth enough if not quite in the “buttery” category. The VX’s stability under this load was a nice surprise. At 250x, the shakes died out in about two seconds. Didn’t I look at any deep sky objects? Sure I did. M37, NGC 457, M35, and, of course, M42. How did they look? Not very good. I was viewing through a layer of haze as astronomical twilight came on, and I couldn’t venture a guess as to how the six-incher’s views of them stacked up to their appearance in the 5-inch SkyWatcher ED. Oh, there was a hint of that refractor goodness, of tiny diamond hard stars, but only a hint on this night. I had the good sense to pull the big switch before I got frustrated, and repaired inside to watch the DVDs of Batman: The Animated Series I got for Christmas. The good news was that the next evening was predicted to be considerably better. Night two certainly was better, at least transparency wise—seeing was still below average. It appeared there was not a chance of clouds intruding, though, so I set out to give the new girl a chance to prove her mettle over several hours. On what? As I have told y’all before—frequently—if you go into the backyard without an observing list, you won’t see much. You’ll look at M42 and a couple of other best and brightest DSOs, decide you’ve seen it all, and wander back inside to watch reruns of Jersey Shore. Not me. Not on this night. I had a list. Or, to be more exact, I had a book. One of my favorite astro-books from the 1980s. Astronomy Magazine Editor Dave Eicher has done a lot for our avocation over the years, but if all he’d ever done was write The Universe from Your Backyard, he’d still be a standup guy in my opinion. This color, large format book breaks down the best deep sky objects constellation by constellation, and is the perfect companion for old fashioned backyard star gazing. I thought I’d start in Auriga, but first I wanted to run a little test. In the above-mentioned Cloudy Nights discussion, I'd asserted that a 5-inch ED scope will beat a 6-inch achromat on anything. Was that true, though? From what little I’d been able to make out on first light night, the images the 6-inch was capable of delivering were not the horror of chromatic aberration induced color and blurring I’d expected. So, what might the 6-inch do on a fairly dim DSO I’d recently observed with the SkyWatcher 120? Like NGC 2158? This little “companion” cluster to Gemini’s M35 was climbing high into the sky now, and I clearly recalled how it had looked in the 5-inch (or almost 5-inch if you insist) a couple of weeks before. 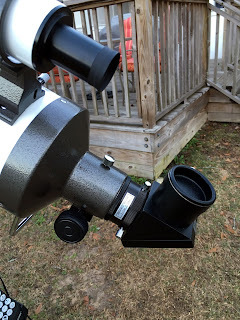 When the scope landed on the cluster, I took a long look at a variety of magnifications. The verdict? At comparable powers, the 6-inch showed NGC 2158 more convincingly than the 120 had, resolving at least a few more stars in the distant cluster at higher magnifications than the smaller instrument had. Thanks to the light pollution, it was not great in the new scope, and certainly not well resolved, but still noticeably better than in the 120, if not worlds better, just as you’d expect from a 30mm aperture advantage. That informative task out of the way, and somewhat heartened by what the 6-inch had done, I began my tour of the winter sky with the help or Mr. Eicher, with the first object being the superb open cluster in Auriga, M37. What did I notice other than the fact that the group was awful pretty? That the Zhumell did a nice job of showing star colors. The red central star was particularly vivid. And how "little" the stars looked even at higher powers. After I'd had my fill of M37, I next visited the other members of Auriga's bright galactic cluster trio, M36 and M38. They were nice, but not a challenge for the six, so following those beauties, I began to hunt dimmer quarry, beginning with a faint little patch of nebulosity, NGC 1931. This relatively dim peanut-shaped cloud can be a challenge for an eight-inch telescope under less than good conditions, so I didn’t really expect to see it in a six-inch, but there it was, even without a filter. I was mucho impressed. So it went through all Auriga and Gemini, till I noticed Orion was now high above the trees to the east. Naturally I went there. I was feeling a bit chilled, and thought I’d wind things up with the Great Nebula. What was it like? Oh, it was great. When isn’t it great? Even in the light pollution there was plenty of nebulosity, with M43 actually beginning to show its comma shape. That was not what caught my eye, however. What did was the Trapezium, and specifically how yellow one of its stars looked in the refractor. I’m not sure I’d ever noticed the color contrast between this sun and its brethren to this extent before, but one thing is sure, the effect was lovely. With M42 admired for an especially long time, I pulled the Big Switch and wrestled Big Ethel off her mount (I don’t have a cover large enough for her and didn’t want to leave her soaking in the dew all night). 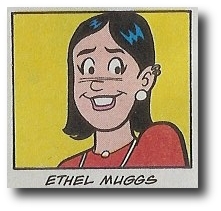 Why “Ethel”? That just seemed right. She’s on the large side just like Jughead Jones’ erstwhile quasi-girlfriend, and is for sure a different type compared to Veronica Lodge (the name borne by my high-toned 80mm Fluorite APO). She is certainly strong, though, given my experience with her on this night. And she also seems to have quite a personality. Despite the nice views of night two, the next day I thought I'd better put the new telescope on my bench. Her collimation had obviously been at least slightly out, and since that was apparent even under fairly poor seeing conditions, I thought it warranted a look-see. Ethel's optical alignment was indeed fairly far off, but half an hour of squaring the focuser and adjusting the objective cell (via nice enough push-pull bolts) with laser and Cheshire was sufficient to put things right. What is next for Big E? With the Moon coming back into the sky, I'll dare to turn her to that bright orb. Do I expect much from her on the Moon and planets? No. But I didn’t expect her to perform nearly as well as she did on the starry sky, either. That refractor mystique hit me for the first time as a teenager when a local camera shop did a star party for my astronomy club. I remember the C-102 fluorite they brought, and the images of Saturn it produced! 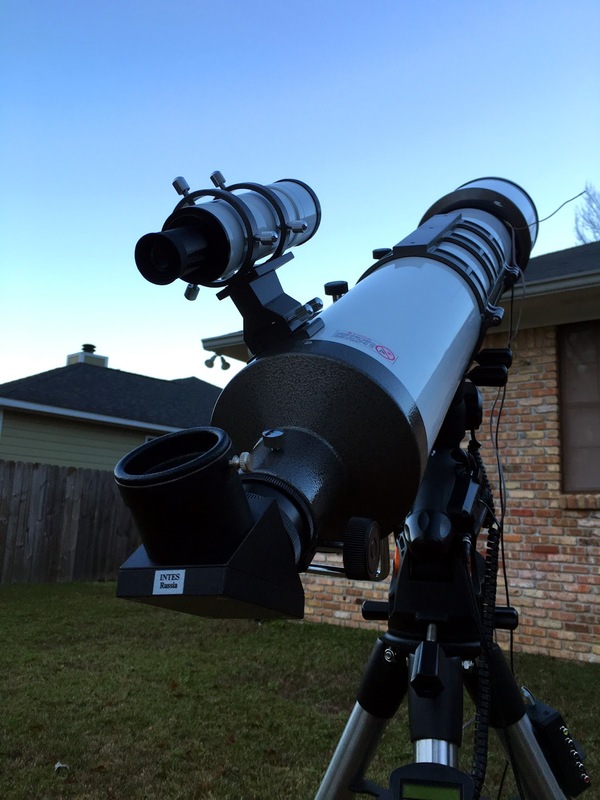 I have a 6" f/8 AP, my 6 inch refractor. Now one of the modern ones, but a mid-80s with standard glass. By today's standard, it would probably be a "semi-apochromat", yet for me it's a keeper. It would be interesting to compare views with a Synta 6"f/8 achro, especially considering how antireflection coatings have advanced in the last 30 years. One other thought, for wide field views, in my old 6" f/8 AP, I use a 40 Pentax XL giving a nice 5 mm exit pupil and just over 2 degrees true field. This can be a "magic" eyepiece for objects like the entire Beehive Cluster and the Veil. I noted you're using a 30 mm, but if you want a little extra, even a GSO 40 SuperView would be very nice at f/8. awesome scope! I just got my first telescope too and I have lately been trying to locate the tabby star...anyone have advice? I was reading on survivingtheaftermath.com if you click disasters then you click the alien megastructure article it talks about the tabby star and it is very real...I want to observe and record the light luminosity myself is this possible? Is Ethel optically the same scope as the Explore Scientific AR152? They look very similar. Nebulosity Grasp: The 152 was noticeably better. Sharpness: The 120 triplet was noticeably better. Jeff was also able to push his power to about 150x before the image began to break down. My image started to break down at anything beyond 100x. We tried to control for eyepiece quality and the collimation on both scopes is pretty good. Given our seeing here on the coast, I was able to push magnification much higher: over 500x with the achromat on the Moon.